Are you a DISH customer? Find the programming you love at a price you can count on, guaranteed for 2 years, from the best TV Provider in your area. 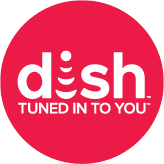 See how much you could save when you leave your TV provider for DISH. We make it easy to enjoy the TV you love. Why? Because we are tuned in to you™. DISH Cares has supplied 110,000 hours of disaster relief in the form of broadband and TV services and diverted 28,000,000 lbs. of waste from landfills in 2017 alone! You can always take HD TV with you thanks to the Tailgater portable satellite antenna. No long-term contracts, no hassles, and no Wi-Fi needed. At DISH, we make installation easy. Our technicians are professionally trained and certified with a 97% satisfaction rating and a passion for helping you get the most out of your new entertainment! And with our 75-minute arrival window, you won’t have to spend all day waiting for the TV guy.